5 Bedroom Detached House For Sale in Sheffield for Guide Price £375,000. 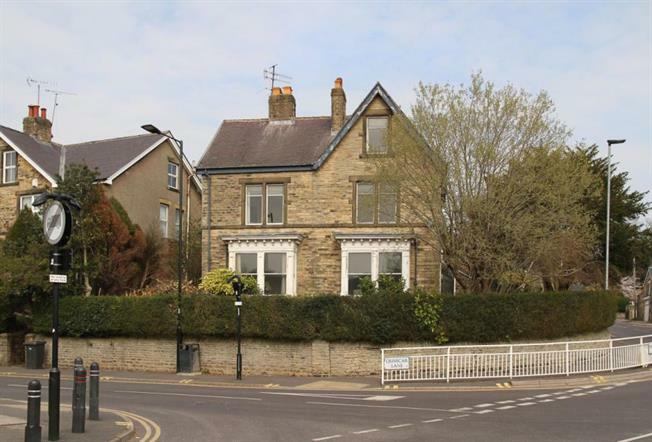 A period five double bedroomed detached family residence in the heart of Sheffield's most sought after suburb, offering incredible scope and potential and retaining many of its original features with stunning village views towards the Mayfield Valley. Situated in the heart of Sheffield's most sought after suburb of Fulwood is this period five bedroomed detached family residence. The property retains many of its original style features and character including sash windows, high ceilings, feature covings and mouldings to many rooms and offers larger than average accommodation with around 2500sq feet of property space. The house now requires a comprehensive refurbishment programme including some building work but offers incredible scope and potential so we recommend viewing as soon as you can. The residence features a large garage/outhouse (28'8x10') to the rear which in turn offers conversion potential and also substantial cellars which buyers may also consider for conversion (both of these options are subject to all necessary consents and planning permissions). Due to the position of the property the front facing bedrooms enjoy lovely views across Fulwood village and across towards the Mayfield Valley and the top floor offers uninterrupted views over to Ringinglow on The Peak District border. There are garden areas to three sides and off road parking. The house has been within the same family for many years so hasn't been on the open market in recent times thus offering a rare and exciting opportunity for the buyer wanting to create a stunning family home for generations to come. Location - Fulwood and Fulwood village are located towards the West of Sheffield; the area is one of the most sought after suburbs in the City and is popular with families due to its fantastic position and location. The village is serviced by a wide range of shops including a garage, greengrocers, supermarket, florist, bakery, a takeaway and a newsagents with a Post Office located within and regular bus services. The Mayfield Valley is within easy reach, with The Peak District National Park border just a couple of miles away, so great for those wanting to explore fantastic scenery and all the facilities The Peak can offer. Closer to the property within walking distance are beautiful woodland areas, walks, children's playground and caf at the popular Forge Dam. Leading on from this there are walks down through Bingham Park which then leads into Endcliffe Park. The house is within walking distance of Nethergreen where there is a micro brewery pub, petrol station and convenience store. Fulwood sits in a prime position for schools with easy access to many along with nurseries and playschools. For secondary schools again there are numerous within easy reach both private and public. Fulwood has a number of private hospitals and teaching hospitals within its locality and features a beautiful church on Canterbury Avenue which dates from around the 1830's. Ground Floor - Entrance lobby with W.C., internal door to garage and doors to the rear courtyard garden. The lobby leads to formal entrance hall with stairs to the first floor. Bay windowed lounge, bay windowed dining room and family dining kitchen with door leading to the rear garden area. From the hall is access to the cellar head leading down to substantial cellars with good head height. First Floor - Landing with stairs leading to the second floor. Three large double bedrooms with the two front facing bedrooms enjoying lovely views and a family bathroom/W.C. Second Floor - Landing with kitchenette area. Two large double bedrooms and family bathroom no.2 with W.C.
Outside - The house is set on a corner position bordering Brookhouse Hill and Crimicar Lane. Accessed from Brookhouse Hill there is off road parking and a large garage/workshop (28'8x10') with W.C. the garden area extends to the side of the house with patio and this leads to lawned gardens to the front with privet hedge/shrubs/tree. To the rear of the house is an inner courtyard style garden with access from both the house and workshop with lots of scope and potential. Any viewers of this property are advised to wear suitable footwear if wanting to go into the cellars etc and we kindly suggest no children due to the size of the house with accommodation over multiple floors. Blundells Auctions, Blundells Estate Agents and their clients take no responsibility for any accidents losses or injuries incurred whilst visiting the property, site or gardens.